Tuesday comes along, and I am like "Wot [was] so funee?" doh!!!!!!! The ONLY reason it is not a problem today is because the funny happened TODAY so it is EASY to remember. When Aaron and I were out and about the other day, I got him a Disney magazine. Despite my having NO MONEY. It added a big fat £3.99 to my overdraft and he has ALREADY broken the free toy that it came with. GGggggrrrrr. 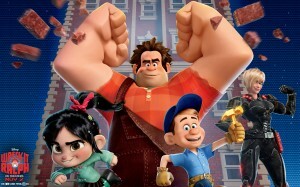 Anyway it features Wreck it Ralph really heavily which is GREAT as Aaron saw it at the cinema. "he's a big strong boy just like me". Aww that's so sweet. I love how they start to see a likeness between them and something /someone they like.